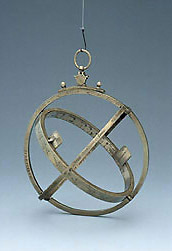 The instrument is an astronomical ring in the format described by Gemma Frisius, with folding rings for the meridian, equator and declination, and a sliding ring for the sights. The meridian ring has a scale of latitude 0 to 90, divided to 10, 5 and 1, and numbered by 10. On the same side is the title 'MERIDIANVS'. The other side is inscribed 'Meridianus' and also carries the signature 'Nepos Gemmae Frisij Louanij fecit 1567'. The outer rim identifies the arctic and antarctic poles in Latin and also has 8 holes for the two screws which fix the suspension to the meridian ring. Slots in the suspension plate allow for latitude adjustment. The equatorial ring is twice titled on one face 'AEquator' and carries a semicircle of hours 0 to 12 numbered by 1, with each hour subdivided to 20 and 4 minutes. On the other face is a similar semicircle of hours, as well as a shadow square. The shadow square is marked 'VMBRA RECTA' and 'VMBRA VERSA' and runs 0 to 12 to 0 divided to 1 and numbered by 1, and also carrying an alternative division into 60 over its length. The equatorial ring also carries a zodiacal calendar. The zodiac appears on the outer rim, divided only into the signs with their names and symbols. The graduations of the ring's hour scales can be used to calibrate the zodiac scale. The calendar is on the inner rim, with each month named and subdivided to 5 and 1. The declination ring carries a zodiac scale of declination, with symbols for each sign, on one face, along with a semicircular scale of declination, 90 to 0 to 90, divided to 10, 5 and 1, and numbered by 10. The other face carries a circular scale of hours, 0 to 12, 0 to 12, numbered by 1, with each hour subdivided to 20 and 4 minutes. The outer rim of the declination ring names and marks the declination of 14 stars. The sliding ring slotted into the declination ring carries two sights, each with a pair of pinholes. The inside rim carries a zodiac scale, with each sign represented by its symbol and divided to 5?, with single degree dots along the edge. The positions of the same 14 stars as on the declination ring are also indicated, so that a conversion can be made from a star's right ascension to solar time. From the engraving style, this inner ring is a later replacement. Provenance: Michel Collection; Billmeir collection (57-84/24).